The idea of turning the historical records of the only international peace conference of the First World War into a full-scale choral drama arrived when I saw they were criss-crossed by the same paths of transforming emotion that run through all the myths of regeneration. In early 2013, when I began reading the archive, I only imagined setting the first of the 20 conference resolutions to music. Its ‘protest against the madness and horror of war’ was silent in the Australian Government’s plans for commemorating Gallipoli. In A Chorus of Women meetings we considered Canberra places where we might sing the piece as the centennial Anzac Day approached. We talked about publicity opportunities we could develop from the coincidence in April 1915 of the peace conference and the Anzacs’ first days at Gallipoli. A Chorus of Women knew the power of good timing from our first song in Parliament House on 18 March 2003, when 150 Canberra women became a national media event by singing a lament for the people of Iraq while the Prime Minister announced Australia was going to war. By mid-2013, the Chorus women were enthralled by the extraordinary story the research was uncovering. I was wondering if the peace conference was a modern epiphany of the death-and-renewal regeneration rhythms that drive the dominant mythic narratives and symbolic patterns of indigenous cultures, including Europe’s. Song-cycle shapes seemed to circle through many of the conference documents. Mapping them showed that through the sharing of sorrow and intelligent, peaceable reflection, people’s remorse about the state of the world could turn from fixity in fear and grief towards the longing, dreaming and hope that tend to bring forth something new. I recognised the creative potency of that course of emergent emotion from the way the ancient social role of a citizens chorus had come alive in us Canberra women in our first decade of commenting on events and issues. We were proof – to ourselves, at least ­– that the love songs of empathic sorrow could be more fertile than the angry roar of protest. And so the feeling grew that we had discovered the potential to place a substantial counterweight of harmony on the grim scales of history. 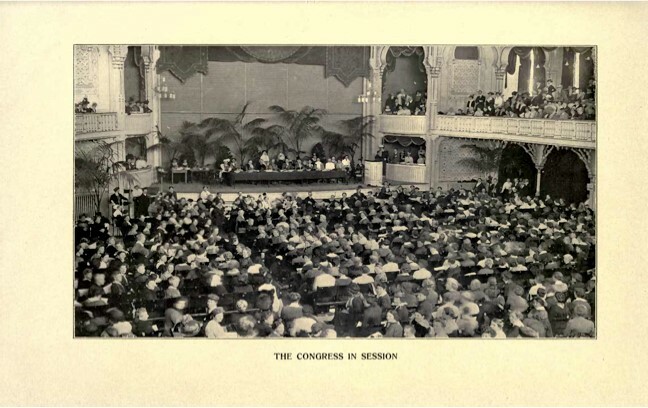 Nicknamed ‘the forgotten congress’, the 1915 peace conference was ignored by the military historians who told the official story of human experience during the war. The 1300 mostly unenfranchised women from 12 warring and neutral nations who attended it were not interesting to writers of reports and books whose subjects were men, war and nationalism. Neither were the Australian and New Zealand members of the well-organised worldwide web of women that the Congress sprang from. While young soldiers like my 20-year-old New Zealand grandfather were being ‘blooded’ at Gallipoli, the 1915 International Congress of Women in The Hague set a 100-year agenda for European unity and international peace, law and human rights. Its resolutions ranged from protest about ‘the reckless sacrifice of human life’ and ‘the horrible violation of women which attends all wars’ to recognition that the ‘common ideals’ of the mass of the people in each country at war were ‘a basis upon which to build a magnanimous and honourable peace’. The congress proposed that women should be granted equal political rights with men, and that no people should be refused autonomy and a democratic parliament. They made the first proposal for an International Court of Justice and other institutions to further the international co-operation that would base permanent peace on principles of justice. They demanded a peace settlement that did not recognise the right of conquest, or the transfer of any territory without the consent of men and women in it. Advocating universal disarmament, they proposed that secret treaties should be outlawed, and that all countries should agree to take over the manufacture and international traffic of arms and munitions of war. Perhaps most telling of their understanding about ways to engender and sustain cultures of peace through generations to come, they passed a radical resolution urging ’the necessity of so directing the education of children that their thoughts and desires may be directed towards the ideal of constructive peace’. By the time the Anzacs were evacuated away from the graves of 11,488 of their comrades in December 1915, envoys of the Congress had met with more world leaders than anyone else saw in the four years of the war. Their report notes that they presented the resolutions and ‘the definite method of a conference of neutral nations as an agency of continuous mediation for the settlement of the war’ to the governments in 14 capitals. After these diplomatic missions, work towards establishing a framework for permanent peace continued through the Women’s International League for Peace and Freedom (WILPF) –– now the oldest international women’s organization in the world. In 1919, WILPF’s voice was the first to warn that harsh reparations imposed upon Germany would lead to another war. In 1920, several of the 1915 Congress resolutions became a basis for founding principles of the League of Nations, forerunner of the United Nations. Jane Addams and Emily Greene Balch, leaders of the Congress and WILPF, were awarded Nobel Peace Prizes. Although there were many robustly debated differences between the remarkable women who led the 1915 Congress, they shared a visionary ethical philosophy which underpinned all their actions. After finding the essence of this articulated in several speeches and writings by Jane Addams I set the words to music for her voice with a Women’s Chorus. Yes, peace is the nurture of Life! As my research broadened, a sense of excitement about its current relevance grew within A Chorus of Women. The feeling strengthened when we discovered that the wonderful story was virtually unknown to the politicians, historians, diplomats, feminist cultural analysts, international lawyers and even pacifists we began telling it to. I was deeply moved by the realisation that the well-ordered, accessible Congress archives and many thoughtful reflections and memoirs of individual women were the contents of a valuable will. To read this bequest was to know that in 1915 the Congress leaders had set out to resource people like us. They had consciously acted for posterity, determining to preserve and pass on the wisdom they had garnered. I also began to see that their actions provided a marvellously coherent 100-year-old exemplar of global citizen action, and key elements of a method for turning a tragically stuck round in the cycles of human life from death to renewal. We Chorus women often talked about the possibility of a system-changing, people-powered wave like that. But while we dreamed hopeful, regenerative movements, Australian prime ministers and government publicists were deliberately, and very expensively, constructing another kind of myth. Theirs is the story that young Australian men were somehow shaping a heroic national identity for us all as they were killed or had their physical and mental health blasted away in the battlefields of Turkey and Europe. I knew the present intergenerational consequences of not reflecting on the meaninglessness of that sacrifice from decades of comparative studies in the cultural psychology of wellbeing and trauma. In the face of immensely complex international challenges like climate change, migration and security, I thought our national leaders were deploying the centenary of the First World War to replicate an immature, degenerative, trauma-based model for our political future. Playing my cello late one night In April 2014, a song arrived. I’d been thinking of Margery Cloughley and Ellen Thwaites, my two great-grandmothers who both had young children at home when one of their sons was killed in the battlefields of France. While the Honest History Group of eminent historians worked to expose the horrifying realities of the First World War and the excesses of ‘Anzackery’, a sense of creative prospect about the Congress story intensified within the Chorus. Possible story structures, musical strands, and 100-year-old images from women’s writings had started following me around, though nothing cohered yet. Ideas brewed in other women. Around us, ample signs showed that schools, community groups, national institutions and media outlets were keen to provide the return governments expected for their allocation of $325 million to centennial commemorations of the war. The specified focus on Australia’s ‘history of service and sacrifice’ was sharpening. The Anzac Centenary Arts and Culture Fund offered $4 million for arts projects that ‘will tell the story of the Anzacs and how their sacrifice shaped our nation’. Although able critics deconstructed it, the concocted trauma-based myth of redemptive sacrifice was being reinforced. And the regenerative story that could have brought peace to the world before the Anzacs left Gallipoli was more or less silent. My Jungian-trained brain produced questions based on homeopathic principles and alchemical equations. How to imagine the canticle of every loving parent’s promise towards its political fulfilment? If the 1915 Congress was a microcosmic remedy of peace for the contagion of war in the great world, what healing harmony would our Canberra chorus of citizens sing in 2015 to redress the trauma storytellers’ public relations barrage? I jotted down a nursery-style tune for children’s voices that wouldn’t leave me alone and seemed to want to become more than I thought it could be. I imagined four or five generations of mothers singing lullabies to the babies born into our family in the past hundred years. Why then were women from both the warring and neutral nations ready to come to this Congress? … By what profound and spiritual forces were they impelled, at this moment when the spirit of Internationalism is apparently broken down to believe that … they would be able to declare the reality of those basic human experiences ever-perpetuating and cherishing the race, and courageously to set them over against the superficial and hot impulses which have so often led to war. songs of nurture for our future! Much energy flowed when we decided to organise a five-day peace festival on the centenary of the 1915 Congress. This gave a container to hold many expressions of the need and meaning of peace now. With Chorus musical director Johanna McBride and other creative friends alongside me, I got on with composing A Passion for Peace: a big task that would bring a cast of 110 Canberra adults and children together with generous support from some of our city’s greatest musicians, artsACT, the Australian Centre for Christianity and Culture, and the embassies of New Zealand and six European governments. 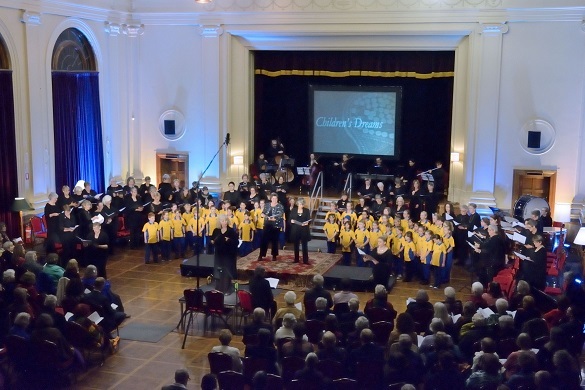 From 28 April to 1 May 2015, we staged the successful premiere season of the Passion as centrepiece of Canberra’s first Festival for Peace while 1000 women from 30 countries filled The Peace Palace in the Dutch capital for the Centennial Congress of WILPF. In the long process of bringing the Passion to life I often thought of the 1915 International Congress of Women as a microcosm and model for the kind of political regeneration that global people’s movements are currently striving to enact in the world-at-large. Theatre is often regarded as that kind of intense, alchemic double of life. Across cultures, ceremonial traditions associated with seasonal renewal (including Christianity’s passion plays) point communities and persons from the excruciation of death towards regenerative possibilities. In Australia during April 2015, the relative proportion of the women’s story to the Australian Gallipoli myth certainly meant A Passion for Peace had to be thought of homeopathically: as the balancing tincture of a potent, specific antidote. Most of my selections in the Passion’s creative development were based on the recurring correspondences I found between the extremely serious pathologies and predicaments of complex political systems in 1915 and 2015, and the timeless good health of the ways the women worked together towards the goal of permanent peace. Of course there are obvious differences between present contexts and concerns, and those of the 1300 peacemakers and human rights activists who gathered in The Hague 100 years ago. But there are many similarities. When I asked First World War specialist Professor Peter Stanley if he would check the Passion libretto for historical accuracy, he happily agreed. ‘The 1915 International Congress of Women is the best kind of history because it shows us something about how to live well now’, he said. His words are encouragement to relate the creative action of the women in 1915 to what we could do now, and to identify and elaborate the methods they followed. He also points to archetypal features of the Congress that cross time, place and human generations, embodying cultural laws for living well. These features distinguish the Congress as an exemplar of ‘that unending myth of death and rebirth’ which C G Jung described as ‘the story of mankind’. Writing in 1918, during the last horrific months of the First World War, Jung associated this myth with ‘the truly creative activity of the brain’ and said it had ‘nothing to do with’ what is commonly thought of as ‘objective’ history. Although, as Jung said, ‘multitudinous figures …weave in and out of this mystery’, very few of those have been the commanders of empires or armies. The long reign of the warrior king on world stages has meant that conjunctions of history and regeneration mythology are unusual and rarely documented. The predominating reflections of the warrior king and his armies’ violating, acquisitive activities in the mirrors of myth and art are other causes of cultural blindness to wisdom –– with the result that there are few great humane, politically savvy teaching stories and little system-enhancing organisational history or theory for the leaders of people’s movements to consult. This paper is a first step towards the goal of contributing to those vital resources by making an exemplary case of the 1915 International Congress of Women. The next step is to sketch the main elements and dynamic structures of regeneration mythology as they manifest in records relating to all aspects of the Congress, and as I distilled them into the libretto of A Passion for Peace. A performance video of A Passion for Peace can be purchased or watched via the website. Regenerating Politics? – a development of Part 2 of this paper – is the subject of Glenda’s talk to Sydney Jung Society on Friday 9 September. The following day Glenda will give a workshop, Listening to the Kindly Ones, with Johanna McBride, A Chorus of Women’s musical director who shares Glenda’s love of the most ancient layers of European mythology. The workshop is an opportunity to get to know and explore personal and cultural meanings in the great story of The Eumenides (The Kindly Ones) –– the regeneration myth Glenda used in writing A Passion for Peace and The Gifts of the Furies, her earlier mythic story-song about relations between people and Earth. See James Brown, http://www.smh.com.au/national/ww1/excess-in-the-anzac-centenary-overlooks-other-military-endeavours-20140225-33foj.html and Anzac’s Long Shadow: the cost of our national obsession (2014), Black Inc Books, Melbourne. See, for example, What’s Wrong with Anzac: The Militarisation of Australian History (2010) by Marilyn Lake, Henry Reynolds et al, and Henry Reynolds’ Forgotten War (2013), UNSW Press, and Unnecessary Wars (2016), NewSouth Publishing, Sydney. The Passion received funding from the embassies of the European Union, Belgium, Denmark, Germany, Sweden and The Netherlands, as well as the New Zealand High Commission. See ‘The Role of the Unconscious’ –– the first paper in Civilization in Transition, the volume of C G Jung’s Collected Works which contains his studies of collective dynamics in contemporary events.